Sanctus Vincentius Lerinensis (Saint Vincent of Lerins). 8x10" Acrylic and gold leaf on panel. Recently I've been working with the "membrane" technique, an ancient technique beginning with an under-painting, a translucent mid-tone, then pushing colors both dark and light. I have enjoyed the rich warm/cool contrast achieved with this technique, and I find myself painting more, well, painterly: limiting my color selection (I used only five pigments total in this icon), and mixing colors fluidly on a palette, rather than mixing one color/step at a time. The more common "proplasmos" method (beginning dark and moving toward light) has been the exclusive method for almost 500 years. Russian master painter Archimandrite Zenon Theodore resurrected the membrane technique in the 1980s after studying medieval manuscripts and ancient icons. He believes that the membrane method predates the proplasmos. He and his students have been popularizing the technique in the last 30 years. Stay tuned for more icons using this technique! Last week, I completed an icon of Saint Vincent of Lerins for a parish in Georgia, USA, using this membrane technique. The patron wanted the name and scroll in Latin, most appropriate for this venerable western father of Christian Orthodoxy. 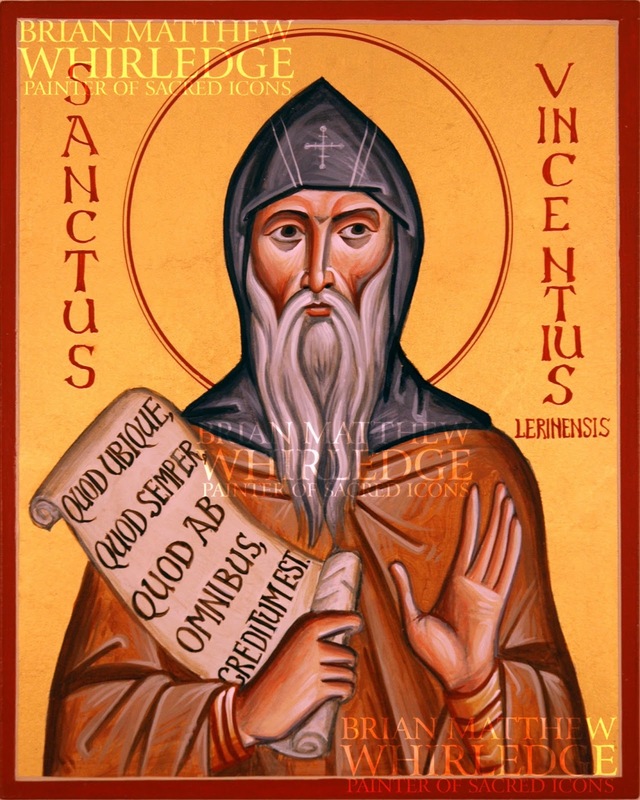 St. Vincent was a leading theologian of the Church in the 5th century, and is celebrated for his definition of the Orthodox faith in a time plagued with errors and heresies: "Quod ubique, quod semper, quod ab omnibus, creditum est." Or in English, "That which has been believed everywhere, always, by all people." His defense of the traditions of the Fathers and his condemnation of innovation and novelty in the Church are as appropriate today as they were in his time.